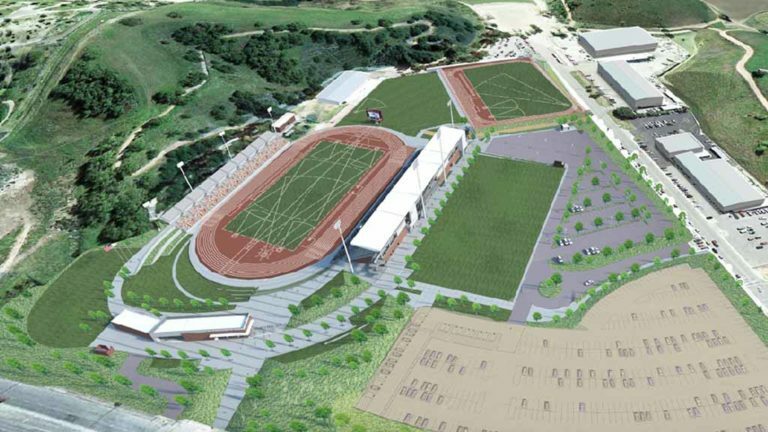 In a ruling that could jeopardize the 2020 Olympic track and field team trials at Mt. San Antonio College, a judge has ordered a halt to earth-moving work on the Hilmer Lodge Stadium project. Los Angeles Superior Court Judge John Torribio granted the City of Walnut’s request for a preliminary injunction. This would halt grading at the site of the 1940s-era stadium — demolished for a new one. “The court finds that unapproved and unlicensed ‘grading’ activities will cause irreparable harm to public safety if grading applications and procedures are not followed,” Torribio wrote in a five-page order dated Wednesday. The order, which arrived in the mail at his Irvine office Saturday but not discovered until Sunday, was delayed because the court fax machine was broken, McClendon said. The assistant city attorney, who lives in the Fallbrook area, said Mt. SAC can’t file an appeal of a prohibitory injunction. 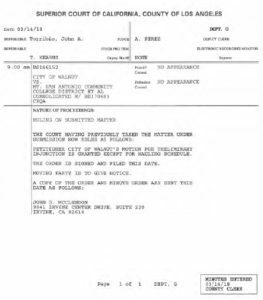 Violating a court order is contempt of court, he noted, punishable by jailing of the defendants, including the college district board of trustees and the school president, William “Bill” Scroggins. McClendon said the city approached Mt. SAC with an offer to settle issues “and proceed forward in a collaborative manner,” but was rebuffed. McClendon earlier submitted evidence that Mt. SAC had ignored five “stop-work” orders, including signs posted Feb. 22 on the perimeter fence and the school’s administration building. On Jan. 26, Torribio heard arguments in his Norwalk courtroom on the preliminary injunction, and decided to give Walnut another chance to force Mt. SAC to stop grading. 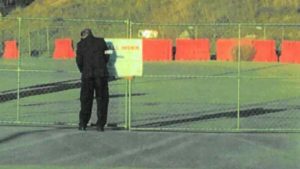 Walnut senior planner Chris Vasquez said he attached five large signs to fences at the stadium site and took photos to prove they were up. But in his court declaration, Vasquez wrote that he returned to the site about 5:05 p.m. and saw all signs had been removed. He submitted a photo he took of a man in a dark suit taking down a sign. Mt. SAC fought the injunction, but the judge said its interest was purely economic. 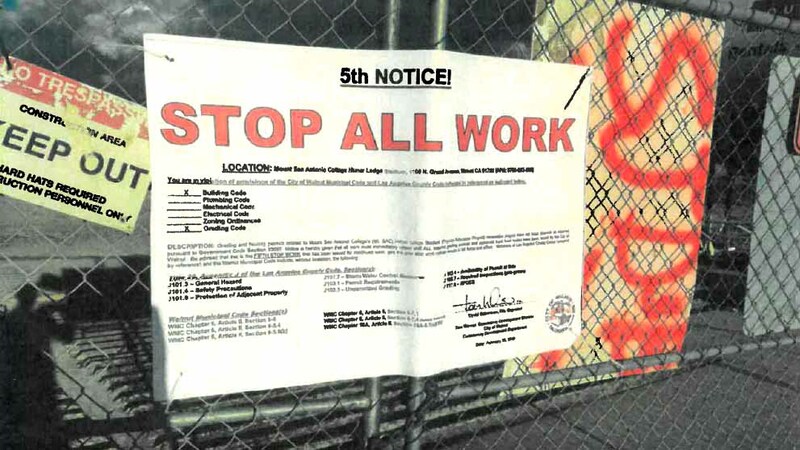 It wasn’t clear how long the work-stoppage would last — or even whether Mt. SAC is obeying the order. Patrick Sandusky, a spokesman for the U.S. Olympic Committee, said the USOC has no role in venue selections for USATF events. Another civil suit against Mt. SAC — arguing that the cost of stadium renovation isn’t covered by a voter-approved ballot measure — is pending. A mid-April hearing is scheduled, with United Walnut Taxpayers saying Mt. SAC shouldn’t be allowed to spend Measure RR money on the project. That referred to systems and practices that protect water quality and associated aquatic habitat through a variety of measures to comply with federal Clean Water Act requirements and the National Pollutant Discharge Elimination System. Scheduled for June 19-28, 2020, the Mt. SAC trials follow three editions held at the University of Oregon (2008, 2012 and 2016) and two at Sacramento State (2000 and 2004). Mt. SAC beat out 2020 bids from Oregon and Sacramento. But if Mt. SAC can’t host the meet, Oregon might not either, according to recent reporting in the Portland Oregonian. “We’re still waiting to learn the fate of the planned renovation of Hayward Field in Eugene,” said Ken Goe, referring to the famed track stadium on the Oregon campus. “The stadium needs to be renovated for Eugene to stage the 2021 World Outdoor Championships. Goe speculated that Sacramento or Des Moines, Iowa (site of the Drake Relays) might be options if Mt. SAC and Oregon fall through. Tokyo hosts the next Summer Games — July 24 through Aug. 9, 2020. Track and field will be held at the new National Olympic Stadium — the same site as the old one, demolished in 2015 and set for completion in November 2019. The $1 billion Kasumigaoka National Stadium will boast a retractable roof, with seating for 60,000 at the Games. “A state-of-the-art stadium like Kasumigaoka is another indication that Tokyo is ready to deliver a dynamic celebration that reinforces and renews the Olympic values for a new generation,” said ESPN in 2012. Artist’s rendering of new Hilmer Lodge Stadium at Mt. SAC.